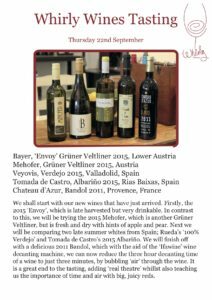 There have been a flood of new wines imported for 2018, so its a pretty exciting time at Whirly wines, 22 Ritherdon road, London, SW17 8QD, whether you are coming to the wine shop or buying wholesale for your restaurant. All the prices below are Ex Vat. 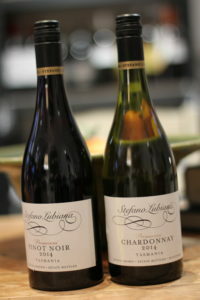 My first “Organic and Bio-Dynamic” wines from this prestigious wine region. Unheard of, to be honest since they are pretty traditional here. 40 year old vines, Organic certified since 2002. Wines made with oh so much passion by Jose Manuel Blanco Perez. His wines speak volumes for the small winemaker making wines oh so exquisite. Christmas Whirly wine mixed case offer & Smoked salmon from the Weald smokery, East Sussex….come in and order before the 7th December…..
Mr Whirly’s Christmas cases, chosen to match classic Christmas fare! Amboise Tourraine, Bonnigal Vignerons, Limeray, Loire: richer than most Sauvignons from Tourraine since its been left on the lees for 5 months. Great match with smoked salmon. Azienda Marzuco, Syrah 2016, Castelvetrano, Sicily: Light, elegant Syrah, only 12.5 alc vol so very unusual indeed, normally Syrah is 14-15% alc vol. Wonderful wine with ham on Boxing day, it would take a little spice, if the ham has been baked in this way. Fruit led, red cherries with some soft black pepper. Azienda Marzuco, Vermentino 2016, Castelvetrano, Sicily: The grape is from Sardinia but this is made in Sicily. Linear clean white wine with some mediterranean salt on the palate with ripe melon. Great with shellfish, fish or even Turkey. Mas Rous, Muscat 2012, Cotes Catalane: dry Muscat, firm and grippy with some lovely orange zest on the finish. Great with goats cheese, Pecorino and Monchego. made from Mauzac and a little Chenin. Great alternative to Champagne, made in the same way and not quite so expensive. Amboise Tourraine, Bonnigal Vignerons, Limeray, Loire: richer than most Sauvignons from Tourraine since its been left on the lees for 5 months. Great match with smoked salmon on Christmas day morning as the lunch is prepared. Graziano Chenin Blanc 2011, Mendocino, California: top end Chenin, not from the Loure, its home but from cool climate Mendocino in Northern California. Vanilla and cream bounce out of the glass. This wine is drinking beautifully for a 7 year old wine from California and shows that wines of this age can be made to last and develop in the bottle over this sort of time. Wonderful alternative to old Chardonnay. Stefano Lubiana, Chardonnay 2016, “ Primavera” : another elegant wine from Lubiana, in the south of the apple isle, Tasmania, near Hobart. Oaked gently, cool climate Chardonnay of delight and wonder. 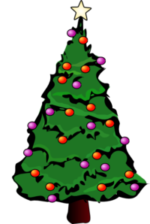 Pick some quiet evening over Christmas and sit down and enjoy. Willespie, Margaret river white 2011, WA: a blend Of chardonnay,Verdelho, Riesling and Semillon from one of the top wine regions of Australia: takes Pork ands spicy dishes oh so well. Mas Rous, Muscat 2012, Cotes Catalane: dry Muscat, firm and grippy with some lovely orange zest on the finish. Great with goats cheese and Monchego. Lillypilly Noble Blend 2006: Noble rot, blend of Semillon, Gewurtz, pineapple with orange blossom. Perfect sticky with a steamed ginger pudding or something similar. Mr Whirly is very excited to present you ten new wines from his recent trip to Sicily in May this year, from the small “Cantine Gulino” in Siracusa, where the boot of Sicily kicks the football of Sicily and the place where civilisation was born in 800BC, we have an abundance of grapes specific to this small wine region; then from Castelvetrano, famous for its olives as well as its vines that are very close to Port Palo, an old destination for myself, Simon and Becky Thomas and Bob Parkinson ( Owns ” Food by Bob” in Cirencester) from a few decades ago, since it has a great beach and restaurant called ” Vittorio’s”, we have some delicious low alcohol wines that offer wonderful value for money for the 750ml bottled Vermentino and Syrah ( £11.95) as well as “Bag in Box” Cattarato and Syrah-Nero D’Avola from only £8.25 a 750ml bottle. 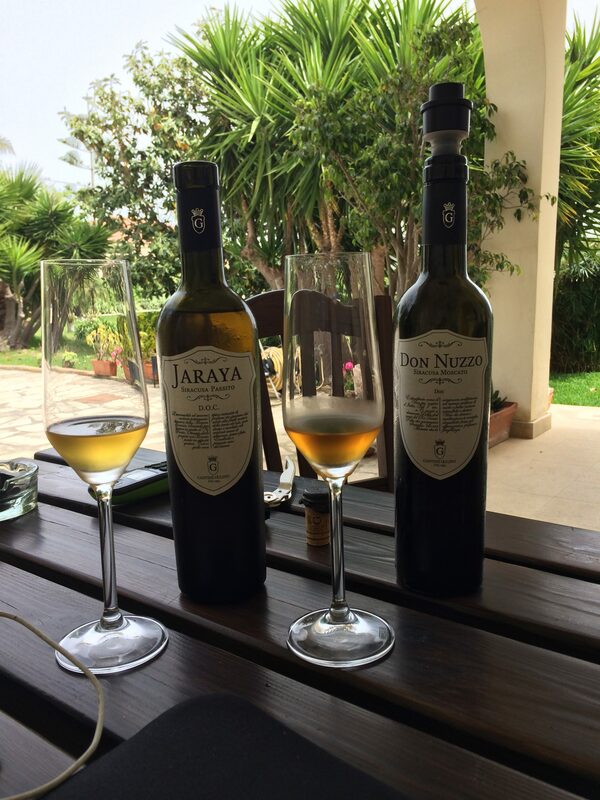 Pictured at the bottom of this post, the very special “Moscato de Siracusa” wines ( ” Don Nuzzo” and ” Jaraya”) from this vineyard, grapes that are specific to Siracusa, sun dried off and on the vine and pure deliciousness in a glass, full of fresh figs and apricots but too syrupy at all, very fresh and acidic. Then we have the ” Pretiosa” label, 100% Albanello, another grape specific to this delightful city, this wine had really interesting palate of ripe Melon and Mediterranean sea salt and would be perfect with Scallops or some other shellfish. 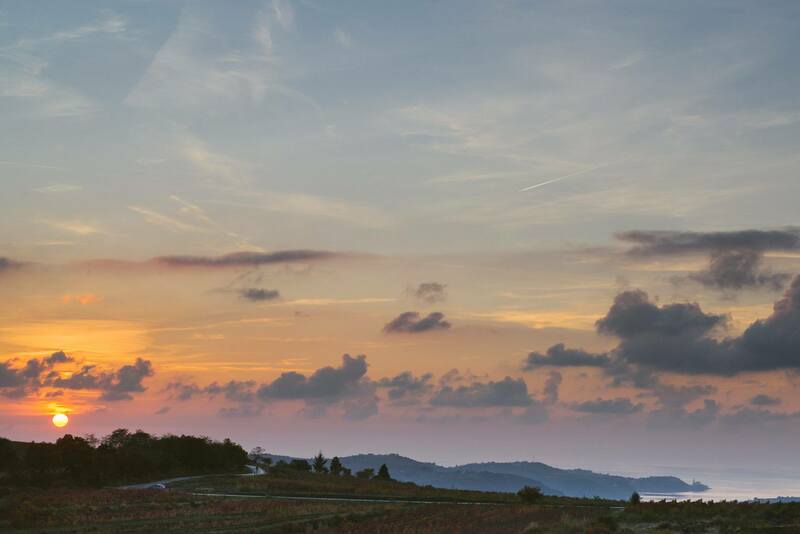 “Cantine Gulino” are the only producer that make the Albanello grape in a single varietal wine. Its beautifully different, therefore a great ” Whirly wine”. The Next white is ” Fania” a gorgeous Aperitif style wine, blending Fiano from Napoli and the ” King of Grapes from Sicily”, Insolia, to make a summer flower wine, perfect as an Aperitif wine. On a recent tasting tour of Scotland and Wales this wine was the most popular of the white wines we tasted. Two reds wrap up this array of wines, the ” Fanus” which is an un-oaked wine, Nero D’Avola and Syrah, very earthy and natural in its style, very much a wine that allows both grapes to express themselves as they are and the “Dru’s”, 100% Nero D’Avola, the main red grape of Sicily and again the home of this grape is here in Siracusa; 12 Months on oak and seriously big yet refined juice. The reason why I am writing about these wines is because of this wine, tasted in London in January and now imported to the UK six months. Buy it and enjoy it. Needs a nice steak or possibly Grouse, now that they are in season. another great find, since its extremely rare to find a Syrah at only 12.5% Alc vol. It has hints of white pepper spice, but the colour and taste is more like a richer Pinot Noir to be honest. It also had some lovely spiced berry fruit, cherries and blackberries and really expresses itself very brightly and happily. Then the find of all the wines at the moment in your local SW17 wine shop is the Nero D’Avola and Syrah from Cantina Gulino out of the ” Barrel”, another light wine in colour and alcohol at 12.5% alc vol, simply bright red cherries in a glass and quite the most drinkable wine you will find in London at the moment at £8.25 a bottle. Their Cattarato- Trebbiano out of the barrel is pretty damn good too, at the same price, spicy stoned fruit, clean and zingy and so easy to drink. So Whirly wine now serves 5 wines for you from the barrel at an affordable price of under £10 a bottle so please come in, taste before you buy and there are not many wine shops you can do that in, whatever city you are living in around the world, and support your local wines business. I am not in anyway expensive, no one can say that of Whirly wines and yet the quality of the wine, I can guarantee you, will far surpass anything from my supermarket friends around each corner of Ritherdon road. 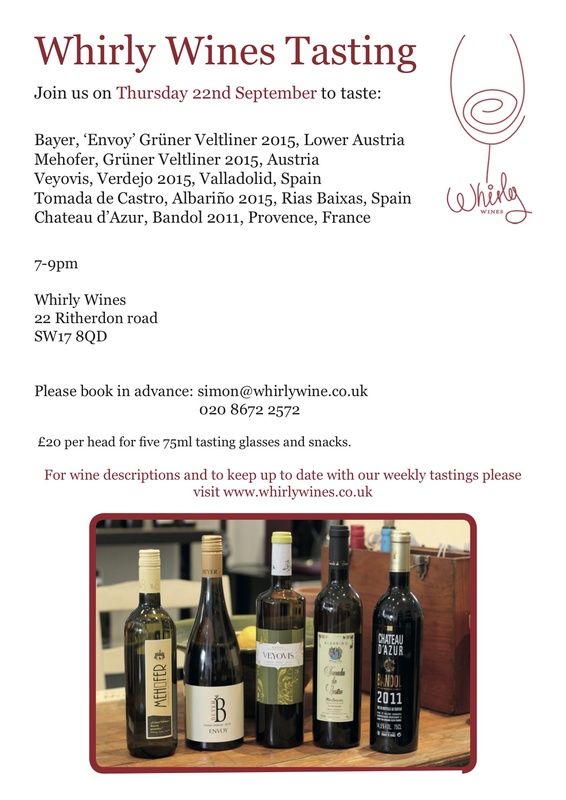 So come into your local wine business, support Whirly wines NOW….I need your support…. After a fraught time at Marco Polo airport in Venice ( told by hire care company that the car I had booked through Car Rentals.com could not be taken out of Italy! Great! So be careful, you really do need to read the small print with car hire nowadays, they are changing their terms and conditions all the time) I grabbed another car and headed in the long curve east around to Trieste, whirled down the steep descent to this glorious city as fast as I was allowed to, stopped for a quick lunch and beer and then skipped across a little piece of Slovenia into the brown hills of the Istria where I am discovering some beautifully made wines. Its all about one grape here really, Malvazia ( with a Z not an S here) which might sound boring but its not since they vary so much from vineyard to vineyard, but they do have one thing in common, they are dry, dry dry. Very much a style I like but i think they are very much food wines and are not in anyway like the Malvazia made just north of here in Collio in Friuli where I will be tonight. Having ditched my Michelin map 736 that covers the whole of Slovenia down to Macedonia, so far too small a scale for Whirly’s liking, I found some lovely people in a garage who sold me a very large scale map of the Istrian peninsula ( we don’t use Sat Nav on whirly tours BTW) and a little advise we popped over a few hills to the most lovely little town called Groznjan. What a find this little town is, little cobbled streets, no cars and some more helpful people, Sasha and Tanya that were in running a wonderful hand made furniture shop as well as a cafe, who delight in telling me about their favourite little vineyards. 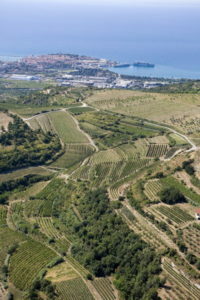 From here I followed my fab large scale map to Momjan where Marino Markozic makes Organic wines of subtlety and finesse. I first of all tasted their RE Brut sparkling wine, made from a assemblage of 80% Malvasia, 10% Pinot Noir and 10% Chardonnay. Bone dry, 6 grams of sugar, dried and candied stone fruit, but unlike anything I had tasted before. Next was a 100% Malvazia, so so dry, exquisite, refined, great strength. 100% steel fermentation, 2015, again stunning quality: dried, candied lemon peel, bitter fruits, needs food. There were no reds made in 2015 due to lack of rain, so I could not taste the locally grown Teran grape which is a shame. The last wine I tasted was their Muscat Momjanski 2015, a great here only find here in Momjan, hence the name. Intense orange peel and zest on the nose, so intense with a little spice and kumquat. Again refined and so well made, 13.5% alc vol, quite spicy and punchy. I am heading back there this morning to try to taste the Teran out of the tank, 2016 with the owner since he’s back at the helm today. Last night was spent in the coastal town of Umag at a wine restaurant called It Istria, run by 7 winemakers of the region. Top wines again tasted, the highlight for me was the wines from Coronica, both the Malvazia and Teran were poured from a newly opened magnum, right up Whirly’s straza and they were mind blowingly gorgeous. So you will forgive me I have to whirl and email Moreno form Coronica, Marino from Kabola and make tracks. I have to be in Slovenia soon after lunch so the map is going to come in great use for short cuts. Break a leg whirly and over and out! More soon, pictures to follow! Big day ahead, tastings planned in three countries, Croatia, Slovenia and Italy. 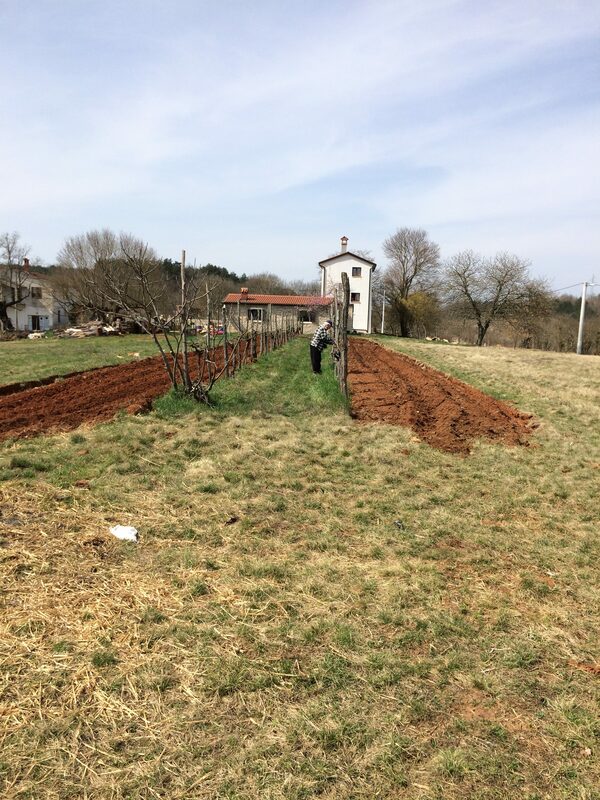 After the wonders of Coronica last night I found the little village of Koreniki just south of Umag on my “very large scale map” and off I went at 8.30am to find the first of many vineyards today. In a little village with a circle of olives trees and perfectly manicured grass in the foreground, I found the HQ of Coronica and Eva who went through the wines with me. I had already tasted their Malvasia 2015 which was more aromatic than other samples tasted so far as well as their ” Gran Teran 2012″ which was superb. Eva explained, the Gran Teran is two years on oak and has only just been released; it takes 4 years to get it ready for the market and is only produced in certain years. In 2014 there was too much rain and not enough sun, which is difficult to comprehend yes, so none was made. The 2015 Malvazia is finished here in the tasting room and I tasted the new 2016 which was good but not as rich as the 2015, I would imagine it needs some more time in bottle. Mareno is the third generation winemaker, his father started making modern technology winemaking in 1990 ( which means bottling of the wines). I also tasted here their ” Gran Malvazia 2015″ which has 1 year on the yeast and a few months on oak. I prefer this style of Malvazia, the oak helps open the wine up and since we are only 3000 metres from the sea here, there is a different feel to the wines from their terroir with a little salt at the end of the wine. 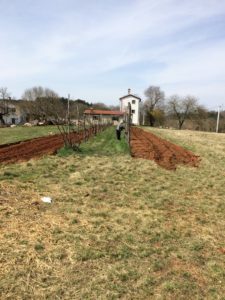 “ We plough the field and scatter, the good seed of the land” is what sprung to mind this morning as I drove through the small patches of vineyards here and saw the red soil that had been newly ploughed up, incredibly rich in minerals. 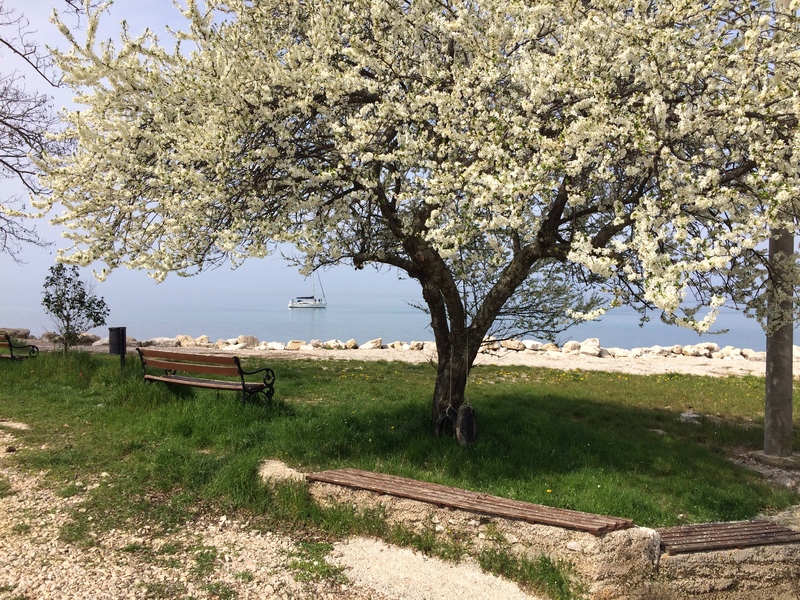 On the way back to Umag I stopped at a little village on the coast and watched a sailing boat motor in and anchor. 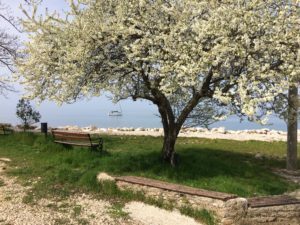 The apple blossom was was out on a tree and the bee’s and hornets were buzzing around it, the smell of the Adriatic combined with the blossom was evocative and joyful. I quick drive north to the corner of the peninsula to Savudrija and Degrassi proved fruitless since they were shut so I followed my large map back to Kabola and managed to meet Marino the owner very quickly, who is a winemaker of repute ( Kabola is the only Organic vineyard here in Croatian Istria) as well a truffle hunter too! Truffles! We love truffles. 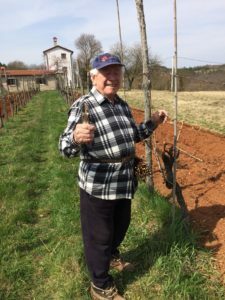 It was on the way back to Groznjan to say thank you to Sasha & Tanya for their help that I once again saw this old man tending two rows of vines in a village called Marusici. I asked to take a photo and this was the result: I am not holding a gun up to him don’t worry, just my i phone but the result is the same! What a lovely man, a lovely face and notice, from his trousers at the back he has the cuttings of the vines hanging that he is pruning. Next stop the crazy Rojac from just across the border in Slovenia making stunning natural wines. Yes you heard it, the penny has dropped, Deeee- dunngg! Mr Whirly’s view on this style of wine has been changed forever. Uros asked me to call him when I reached the first roundabout after the the Croatian border crossing. But I ignored this and almost found his vineyard myself until he whizzed around the corner on his scrambler motorbike. Yes I would say Uros lives life to the full was the first impression that he made on me. On the you tube video is the first wine we tasted, click on it and have a look please, its pretty exciting stuff, hand disgorging of his ” Moia” wine, ” Mine” into an ice bucket full of water, oh the theatre and excitement of wine and winemakers! He says to me as we taste the fizzy, frisky pink juice, “ I want sincerity, I want the grape variety, I want the terroir.” This wine showed me that winemaking this way can be exciting, fresh and vibrant and simply enjoyable to drink not something I have come across before with most natural wines. Next up was a 2016 Malvazia, selected yeasts and a delight! No label. I want it. Next a 2013 Orange wine, all about maceration here, indigenous yeast so that means natural from the skin like in Roman times man! Next, we are moving from one wine to the next in rapid succession, Malvazia Letnik 2013, 60 days skin contact, 2.5 years in oak, big barrels, completely bio-dynamic wine, old style.Then some Refosk: re means king, fosk means something dark. This is a very old grape from these parts. 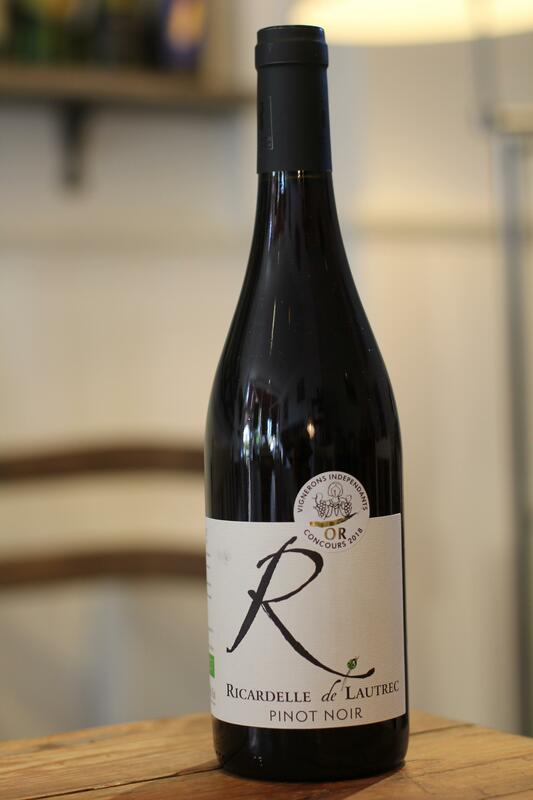 We taste a 2014 Refosk and even though there was a great deal of rain at the wrong time ( September) Uros has still managed to make a great wine, a very puristic wine. Next a Ronero 2016 out of tank; Max Ro-Nero! This is a big story wine: the grapes are dried naturally on the plant, picked at 8 gms of sugar, slightly sweet but delicious and it then spends 5 years in the bottle before being released to be drunk. As I drove Uros down the hill and dropped him off at that first roundabout and drove north to the Italian border, it struck me that I had just witnessed a man in his complete entity. 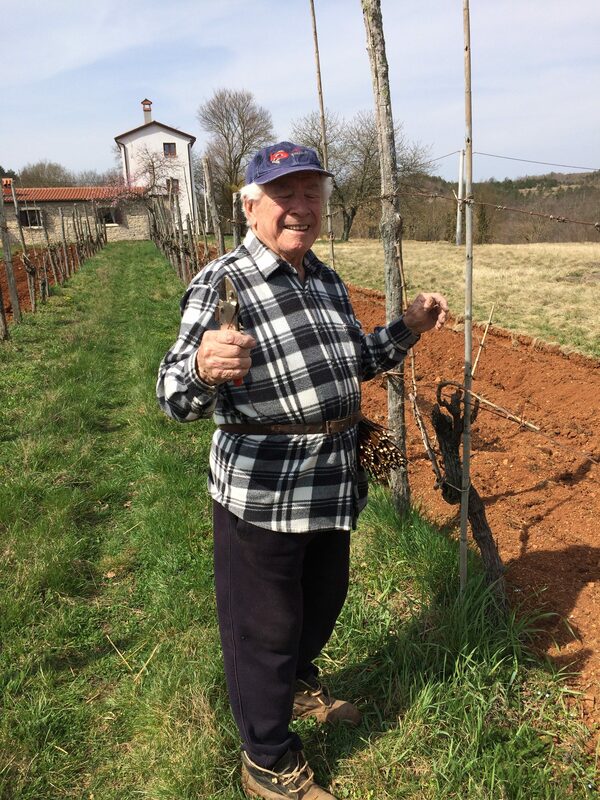 Here was som eone making his own style of wines, in a far flung country not recognised by the mass wine market but in a state of complete happiness. The penny had dropped for him and for Whirly. From here I headed to find Martin in a wine region of Slovenia called ‘ Kras”, a limestone plateau just to the east of Trieste. I had been here before and loved their salami which they make themselves from their own “sounder of swine.” However it was very much a case of following my nose since my large scale Croatian map had run out at the border and the sat nav is not a thing we use on a Whirly tour as you already know. So it took me an hour or so to find ( ok 2 hours) but the fun I had completing this journey was immense. In order for me to find the vineyard I had to stop in a little country town to ask directions called Trebiciano to ask directions to Sezana just across the border. A stop entailed a little expresso and a bombolino ( ok two) at a cafe and a chat to a local gentleman who pointed me in the right direction. After a Graci and a farewell I thought this would not have happened if I had been using a SN and I would have simply driven to the ” Ostirjeva Kmetija” without any interaction with the locals. By the time I reached the salami place just east of Dutovjle the sun was setting and I had still a tasting or three to finish. Martin showed me some of his wines I chomped gleefully through his salami that is daughter, who is still at school but was running the shop very efficiently, had carefully cut and laid out for us. 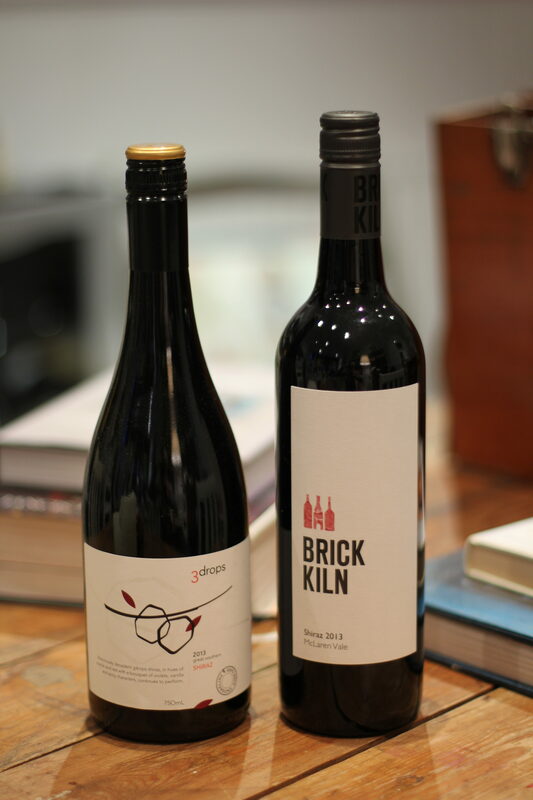 His wines are honest wine and made in a lovely simple and old school way. I would im port them, in fact they are the perfect wines for me since they would be at the right price and I would be able to sell them under the vital £10 mark. But lets see how we get on with his salami for the shop shall we!? Martin is keen for me to taste some wines at another natural vineyard back in Dutovjle so he drives be back to Rencel, a vineyard that started in 1986. It is here that I am told that this area his the home of Teran ( another name for the refosco grape) and that Martin has indeed gone to Brussels to fight the Croatians who have stole the name for their wines. 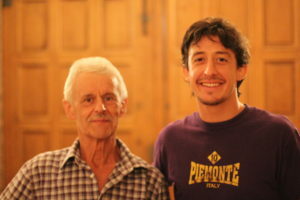 Josko Rencel, the owner makes wine in very small amounts, 500 or 1000 bottle parcels so he’s pretty damn tiny. His wines, like Rojac are not ” inexpensive” either but the quality cannot be denied. Its all about Teran here as I have already explained. First off is the ” Kras Carso” 2013, natural yeast, only 1000 bottles made 75% Teran. Then a Pinot noir 2009, macerated for 8 days and then 5 years in barrel. Serious wine. 800 bottles made. Vincent 2013: Sauvignon, Malvazia and Chardonnay. Next the local grape. ” Vitovska Grganja”, ” Orange wine”, different process of maceration which is basically the opposite to rose wine which is creating a rose style wine from red grapes, goo but not me. Then a Sauvignon blanc 2012, malolactic, 3 days of maceration, yellow Sauvignon! Then a Cuvee 2009 Orange wine, same blend as above, no sulphites, 5 years in oak: ” Cameroe” 2003, 16.5% alc vol ( variation of Amarone, dried grapes): Negra 2006, Teran 2006, 6 months of drying the grapes, amazing wine: ” Malvazia 2003″ sweet wine, 6 days drying, 8 years in barrel 100% Malvazia….at this point given that it was now 8 pm and I still had to drive 1 hour without a sat nav my mind began to wander and my notes did not cover the reaming two wines. What I can say is that yet again my thoughts and feelings on Natural wines have been transformed: they can be fresh and enjoyable so drink. In Friuli the next day after a late night drive to Cormons I tasted some really young but exciting wines from Buzzinelli.What was to me extraordinary was the fact that these wines were half the price of some of the wines I tasted on my last two day trip but also only half as good, in my humble opinion. What have `I learnt from this trip? The wines from the smaller producer, in general, are increasingly difficult to find for that £10 bottle and that I will have to find these wines in future from slightly larger producers. Sad but true. Just before Christmas I imported some delights from Tasmania, McLaren Vale and The Great Southern in Western Australia. Stefano Lubiana makes some of the most sublime wines down under, let alone Tasmania, “The Apple Isle”. His Primavera wines are a pure delight and that night we will kick off with the Chardonnay 2014 and follow it with the Pinot Noir 2014. To follow we will then taste two Shiraz’s one from ” 3 drops” in Mount Barker, way down south of Perth not far from Cape Leeuwin where the Southern ocean meets the Indian: followed by a Brick Kiln Shiraz from McLaren Vale south of Adelaide in South Australia where I picked grapes for a $ a bucket in March 2000! We these last two wines we shall have some theatre and use the Ifawine air system to emphasise the importance of air before drinking bigger heavier reds. 7.0opm to 9.00pm: £30 for four 75ml measures plus snacks. 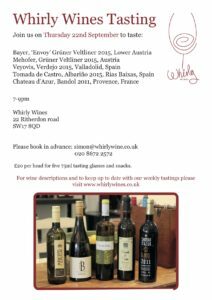 Please book by emailing simon@whirlywine.co.uk. A minimum of 10 people and maximum of 20 for the event will apply. Payment must be taken before the event. Below is an article about Woods wines bar in Dulverton, Somerset. I have been working with Woods for the last 8 years and I supply 50% of my wines for their list. It makes good reading and Paddy Groves is a legend! Dry January, surely not! Don’t forget its still important to drink wine! Dry January, what is this! Its a terrible thing! Above are father and son, Giovanni and Mauro from the famous Manzone vineyard in Monforte D’Alba, right next door to Barolo in Piemonte, making some of the most exciting wines in Italy if not the world. Do you know these wines are now stocked in your local wine shop here in Tooting, SW17! Yes they are right on your doorstep and they are the most wonderful wines: whether its their single vineyard Barolo ” Il Castelleto” 2011 or their wonderfully smooth and Velvety ” Langhe” Nebbiolo ” Il Crutin” 2012 these wines show the finesse and subtlety of this lovely grape that now has the same following as Bordeaux in terms of investment wines. I also have their unusual and rare Rossese Bianco 2014, a long lost white grape from Piemonte that has been oaked for 12 months. 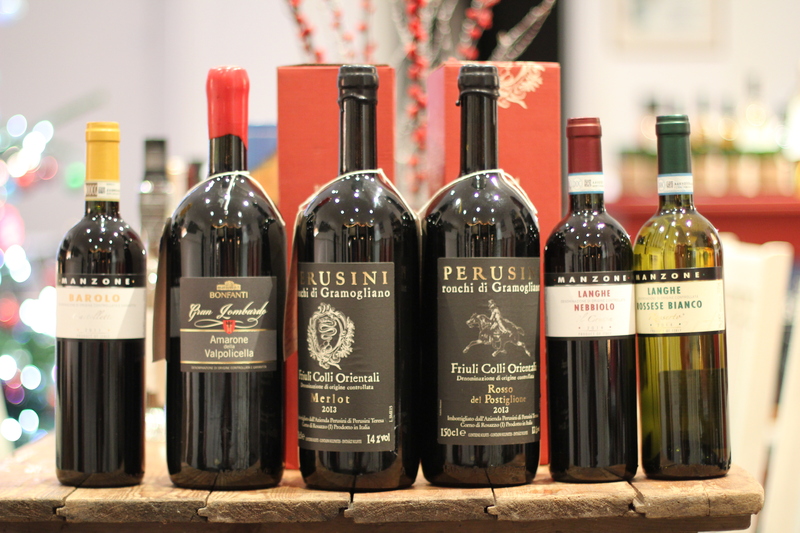 Combine these wines with some stunning Amorone and Ripasso from Bonfanti in Verona and some classy offerings from Perusini in fruli ( top magnums please see below picture) including Riboilla Gialla and Sauvignon Blanc as well as some Merlot and Refosco red offerings. Don’t forget we also offer Organic wines from La Bouysse in Corbiere from the barrel at only £10.50 a litre which equates to £7.50 for a 750ml bottle. So don’t feel blue in January come into the Whirly shop and let me cheer you up! 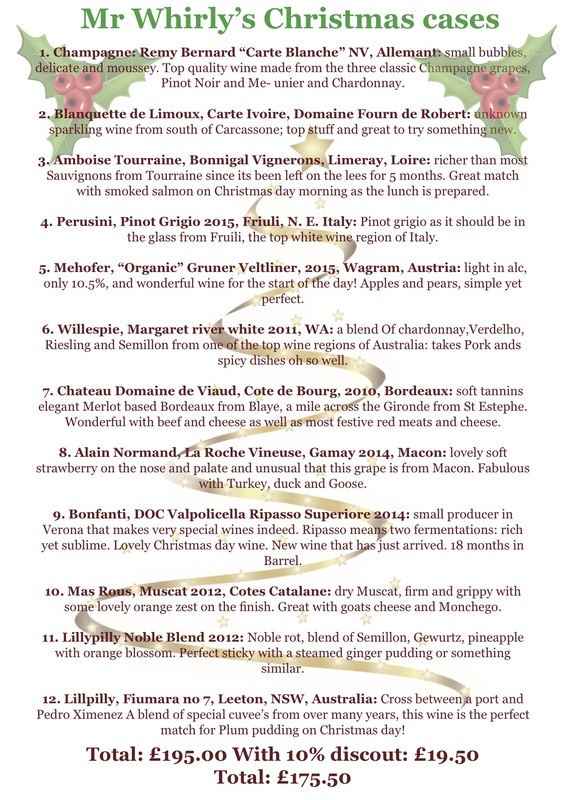 Mr Whirly has hand selected cases of 6 and 12 with wines chosen to match classic Christmas fare! From Blanquette Limoux whilst cooking to “La Roche Vineuse” Macon Gamay for the Turkey, to Lillypilly’s Fiumara No. 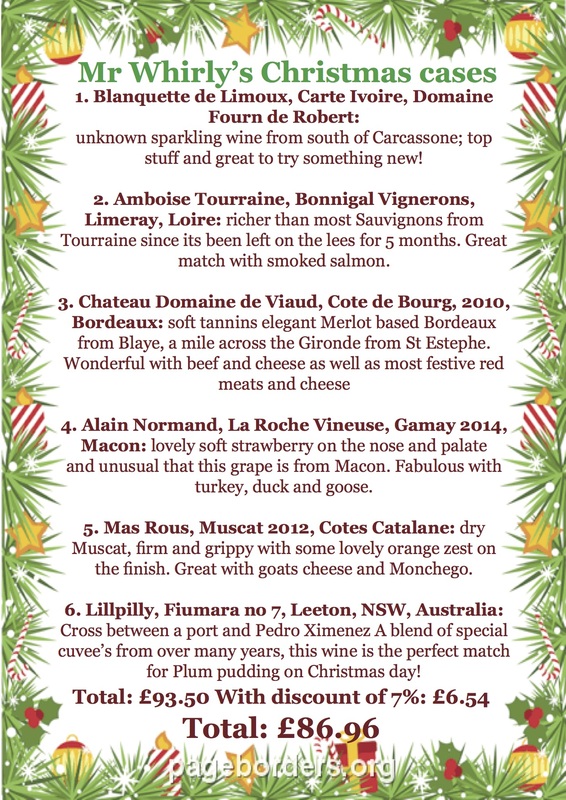 7 for your plum pudding, and everything in between, you are sure to find a wine for every course and every guest! unknown sparkling wine from south of Carcassone; top stuff and great to try something new! 2. Amboise Tourraine, Bonnigal Vignerons, Limeray, Loire: richer than most Sauvignons from Tourraine since its been left on the lees for 5 months. Great match with smoked salmon. 4. Alain Normand, La Roche Vineuse, Gamay 2014, Macon: lovely soft strawberry on the nose and palate and unusual that this grape is from Macon. Fabulous with turkey, duck and goose. 5. Mas Rous, Muscat 2012, Cotes Catalane: dry Muscat, firm and grippy with some lovely orange zest on the finish. Great with goats cheese and Monchego. 6. Lillpilly, Fiumara no 7, Leeton, NSW, Australia: Cross between a port and Pedro Ximenez A blend of special cuvee’s from over many years, this wine is the perfect match for Plum pudding on Christmas day! 1. Champagne: Remy Bernard “Carte Blanche” NV, Allemant: small bubbles, delicate and moussey. Top quality wine made from the three classic Champagne grapes, Pinot Noir and Me- unier and Chardonnay. 2. Blanquette de Limoux, Carte Ivoire, Domaine Fourn de Robert: unknown sparkling wine from south of Carcassone; top stuff and great to try something new. 3. Amboise Tourraine, Bonnigal Vignerons, Limeray, Loire: richer than most Sauvignons from Tourraine since its been left on the lees for 5 months. Great match with smoked salmon on Christmas day morning as the lunch is prepared. 4. Perusini, Pinot Grigio 2015, Friuli, N. E. Italy: Pinot grigio as it should be in the glass from Fruili, the top white wine region of Italy. 5. Mehofer, “Organic” Gruner Veltliner, 2015, Wagram, Austria: light in alc, only 10.5%, and wonderful wine for the start of the day! Apples and pears, simple yet perfect. 6. Willespie, Margaret river white 2011, WA: a blend Of chardonnay,Verdelho, Riesling and Semillon from one of the top wine regions of Australia: takes Pork ands spicy dishes oh so well. 7. Chateau Domaine de Viaud, Cote de Bourg, 2010, Bordeaux: soft tannins elegant Merlot based Bordeaux from Blaye, a mile across the Gironde from St Estephe. Wonderful with beef and cheese as well as most festive red meats and cheese. 8. Alain Normand, La Roche Vineuse, Gamay 2014, Macon: lovely soft strawberry on the nose and palate and unusual that this grape is from Macon. Fabulous with Turkey, duck and Goose. 9. Bonfanti, DOC Valpolicella Ripasso Superiore 2014: small producer in Verona that makes very special wines indeed. Ripasso means two fermentations: rich yet sublime. Lovely Christmas day wine. New wine that has just arrived. 18 months in Barrel. 10. Mas Rous, Muscat 2012, Cotes Catalane: dry Muscat, firm and grippy with some lovely orange zest on the finish. Great with goats cheese and Monchego. 11. Lillypilly Noble Blend 2012: Noble rot, blend of Semillon, Gewurtz, pineapple with orange blossom. Perfect sticky with a steamed ginger pudding or something similar. 12. Lillpilly, Fiumara no 7, Leeton, NSW, Australia: Cross between a port and Pedro Ximenez A blend of special cuvee’s from over many years, this wine is the perfect match for Plum pudding on Christmas day!